Studies have already shown illustrations of user-generated pro-tobacco content in video-sharing sites such as YouTube,21 ,22 photo-sharing sites such as Instagram23 and Facebook.24 ,25 However, there has been little investigation of the volume or characteristics of online industry-sponsored tobacco advertisements. Particularly in those unaware of emerging tobacco products, online advertisements may be the first point of exposure, which has been shown to be particularly effective in influencing behaviour.26 ,27 Advertisements are placed by media planners to specifically reach a target audience, which may include at-risk groups, such as youth, young adults and racial/ethnic minorities. Using services available through advertising and media planning agencies, we conducted advertising surveillance over 1 year in order to quantify the volume and characteristics of the tobacco industry and e-cigarette online banner/video advertisements and investigated the demographics of the online audience that they reach. Data will inform strategies to limit the exposure to online tobacco and e-cigarette advertising, particularly among vulnerable populations. Online advertisements were identified through Competitrack (http://www.competitrack.com), a full-service advertising firm that captures specific industry advertising (specified by the client) through monitoring 21 media sources, including online. Competitrack's web portal captures the advertisement as presented to the consumer (eg, in display or video format) as well as associated meta-data including: (1) date range observed (which does not necessarily mean that the advertisement occurred on every single day of that range); (2) first market aired (eg, National); (3) target market (eg, consumer vs business); (4) websites on which the advertisement occurred; and (5) estimated dollar amount spent on media placement based on an algorithm defined by Competitrack. This estimate is determined by considering unit costs, unit factor and audience factor. Further information is available in online supplementary appendix A. Competitrack's surveillance is limited to advertisements aired in the USA and Canada (both were allowed here) and our account is restricted to tobacco product and e-cigarette advertisements sponsored by the industries only. Furthermore, Competitrack only monitors the top 250 websites/URLs for online display advertisements and 100 websites/URLs for online video, determined by a combination of Alexa rankings (a leading provider of global web metrics, http://www.alexa.com), comScore page views or video advertisement impressions data (a leading internet technology company, http://www.comscore.com), and client feedback (methodology described through personal communication with Competitrack representative). Competitrack's surveillance does not capture affiliate marketing, a form of marketing in which a business rewards affiliates for each visitor or customer brought in by the affiliate’s marketing efforts.28 User-generated promotional messages, such as social media or blog entries posted by an individual not affiliated with the tobacco or e-cigarette industries, are also not captured through this service. Online advertising expenditures were obtained for all relevant advertisements in addition to detailed information on the websites on which the advertisements were aired. A complete list of these websites was sent to partners at PHD Worldwide (http://www.phdww.com/home.aspx), a media and communications agency that specialises in target audience refinement, channel selection and media allocation. Target demographics (age, gender, race/ethnicity) of the website audience was gathered by a representative at PHD through data compiled by GfK Mediamark Research & Intelligence (GfK MRI, http://www.gfkmri.com). This proprietary audience demographic data are typically used by advertisers to target advertisement placement to achieve maximum exposure to their intended audience. However, demographic information was not complete; it was available for the following number of websites on which advertisements were placed: (1) 30 of the 45 websites on which e-cigarette advertisements were placed; (2) 19 out of 25 on which cigar advertisements were placed; (3) one of two websites on which cigarette advertisements were placed; and (4) 86 out of 115 websites on which snus advertisements were placed. For those websites with demographic information, the average per cent composition and range of unique users fitting into each demographic subgroup were calculated in total and by product type. The characteristics and themes of online advertisements were coded based on a methodology adapted from a previous study.30 Two trained coders were instructed to independently view each advertisement and fill out a corresponding coding sheet addressing the following topics: (1) the use of themes (eg, use for harm reduction, use for quitting); (2) whether the advertisement contained flavoured products (including menthol); (3) use of price discounts or sweepstakes; and (4) whether the advertisement—if clicked—went to a landing page and, if so, the nature of the landing page and whether it featured information on smoking cessation. Agreement between coders was 93.4%; all disagreements were settled by an additional coder. Anderson et al31 recommend that inter-coder reliability exceed 85%. The meta-data (described in Advertising surveillance section above) and advertising expenditure data from all advertisements were downloaded and entered into an Excel database. Unique identifiers linked these data to a PDF or video of the online advertisement. The number of unique advertisements as well as the number of unique websites on which advertisements occurred were summarised in total, by product (eg, e-cigarettes, cigars) and by brand (eg, blu e-cigarettes). Websites were also categorised by two separate trained coders into subject-matter categories, including news, reference/search engine, sports, health and beauty, real estate/design, cars/motorcycles, sales, politics, music/entertainment, lifestyle, racial/ethnic, video games, job search, men's magazines, cooking, and other. Website topics, advertisement themes and advertisement meta-data (eg, spend) were analysed in whole as well as by product (eg, e-cigarettes, cigars) and by brand (eg, blu). During the course of 1 year, advertising surveillance services identified 43 online advertisements sponsored by the tobacco and e-cigarette industries: 37 promoting tobacco products and e-cigarettes and an additional six promoting the corporation, Altria. Of the 37 product advertisements, 24 unique advertisements promoted various brands of e-cigarettes, five promoted cigars, seven promoted snus and one promoted cigarettes (table 1). All but two were online display; the remaining two were online videos promoting NJOY e-cigarettes. Most of the videos ran on the ESPN website, while a few additional spots were run on TMZ.com. Online advertisements were evident only for certain tobacco and e-cigarette brands—most notably Swedish Snus (seven advertisements), NJOY e-cigarettes (seven advertisements), Green Smoke (eight advertisements) and blu (four advertisements). The range of days in which advertisements were observed varied; the single Newport cigarette advertisement was detected on only 1 day, while White Cloud e-cigarettes, Thompson cigars and Swedish Snus advertisements were, on average, observed for up to a third of the year. The amounts of money spent on advertisement placement also varied considerably, with the total spend ranging from $84 for all eight GreenSmoke advertisements to $933 748 for seven Swedish Snus advertisements. Tobacco and e-cigarette advertising were found on a total of 180 out of the 250 websites that Competitrack monitors. Swedish Snus advertisements appeared on a majority of these websites (n=115 websites), followed by advertisements for e-cigarettes (n=46), cigars (n=25) and cigarettes (n=2). Snus advertisements appeared on websites covering numerous topical areas, from news and music/entertainment to real estate/design, health and beauty, to cars and job search sites. Conversely, e-cigarette advertisements tended to be placed on websites focused on music/entertainment (39.1% of the websites on which e-cigarettes advertisements were placed were on sites of this topical area) or news (17.4%). Certain brands of e-cigarettes focused on one of these subject areas specifically; for example, NJOY placed half of their online advertisements on either music/entertainment sites (eg, TMZ.com) and the remainder on sports websites (eg, FightHype.com). Vapor4Life also focused heavily on music/entertainment (eg, LyricsMania.com), placing 64.2% of their advertisements on such sites. The majority of cigar advertisements (60%) were placed on news sites, with the remainder placed mainly on music/entertainment or sports sites. Similar to e-cigarettes, however, placement differed by brand. For example, Macanudo cigars placed all of their advertisements on sports sites (eg, ESPN.com) and Thompson cigars placed 78.9% of their advertisements on news sites (eg, USAToday.com). The demographic characteristics of individuals potentially exposed to tobacco and e-cigarette advertising online are displayed in table 2. Among the websites for which information was available (30/45 for websites displaying e-cigarette advertisements, 21/25 displaying cigar advertisements, 1/2 displaying cigarette advertisements, 89/115 displaying snus advertisements), media data estimates that 8.0% of the audience exposed to the advertisements were under 18 years of age. e-Cigarette advertisements were placed on websites with the highest average percentage of a youth audience (10.5%), but some advertisements (eg, White Cloud e-cigarettes) were placed on websites (123mycodes.com) where up to 35.0% of their audience consists of youth. The average percentage of young adults, 18–24 years of age, potentially exposed to advertisements is even higher, with rates as high as 33.9% for White Cloud e-cigarettes and 36.9% for Swedish Snus. The average proportion of the website audience exposed to all online advertisements who were black and Hispanic was 8.8% and 11.0%, respectively. However, the range extended up to 38.6% black and 22.6% Hispanic for websites on which e-cigarette advertisements were placed, up to 22.0% Hispanic for websites on which cigar advertisements were placed, and up to 43.3% black and 18.7% Hispanic for websites on which snus advertisements were placed. The themes and characteristics of the online advertisements are displayed in table 3. e-Cigarette advertisements were most likely to feature themes of harm reduction (featured in 37.5% of e-cigarette advertisements), use as a cessation aid (20.8% of e-cigarette advertisements), being more ‘green’ or environmentally friendly than cigarettes (54.2% of e-cigarette advertisements) or being an alternative to cigarettes when someone cannot smoke (33.3% of e-cigarette advertisements). This varied by product; all Green Smoke advertisements, for example, featured the theme of e-cigarettes as more environmentally friendly than cigarettes, while NJOY, blu and White Cloud advertisements were more likely to suggest harm reduction or use as an alternative to cigarettes. An example of this theme from a White Cloud is featured in figure 1. The theme of use as an alternative to cigarettes was the only theme assessed in this study that was featured in any of the cigar advertisements (featured in 25.0% of cigar advertisements) or snus advertisements (featured in 14.3% of snus advertisements). Otherwise, cigar advertisements did not feature any of the themes specifically assessed here. Cigar advertisements mainly mentioned price promotions, breaks or discounts (50.0%), or sweepstakes offerings (50.0%). An example of this in a Thompson cigar advertisement is featured in figure 2. Snus advertisements also featured price promotion, break or discount (50.0%) and all seven advertisements featured a flavoured product (notably mint/menthol). Cigarettes were omitted from table 3 since there was only one advertisement (Newport), but this particular advertisement suggested that the product is less expensive than other cigarettes and featured a price promotion. More than half of all advertisements (57.0%), when clicked, linked to another website or landing page (links may have been broken by the time of the study); most consisted of the company's home page (87.0%). Not one of the landing pages featured any information on how to quit smoking. 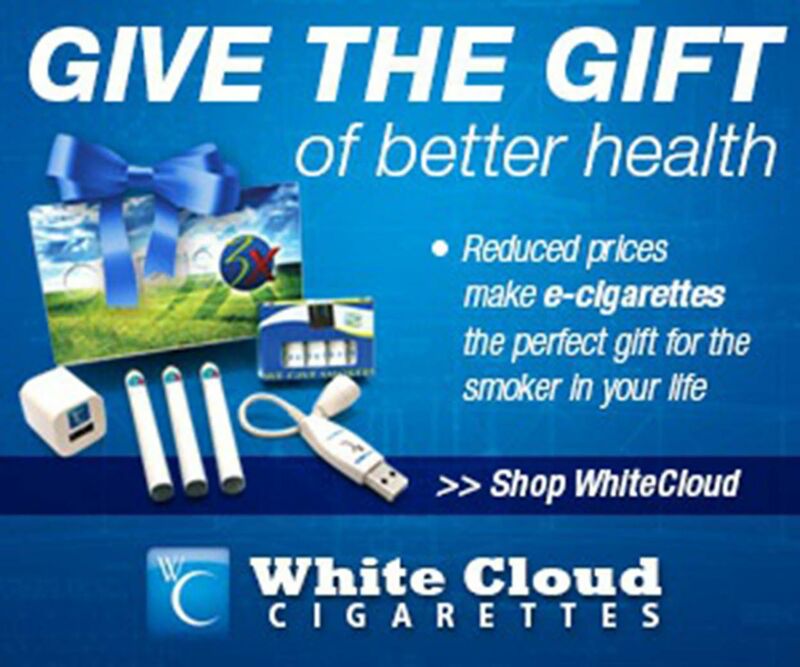 Example of an online e-cigarette advertisement with harm reduction claims. Example of an online cigar advertisement with mention of a price discount. This study examined the volume, characteristics and target audience of online banner/video tobacco and e-cigarette advertisements. Relatively few advertisements were observed over the course of a year, only 43, and those that were observed were mainly for e-cigarettes, snus and cigars. Even within these categories, only a few specific brands were noted, notably Swedish Snus and blu, GreenSmoke and NJOY e-cigarettes. The financial investment for most advertisements was minimal (under $3000), with the exception of Swedish Snus and NJOY which together accounted for roughly 98% of the almost $2 million total spend. Given that the tobacco industry spends roughly $8.8 billion per year marketing cigarettes and smokeless products in the USA alone,2 ,32 online banner/video advertising does not represent a large portion of their financial investment. Since this type of advertising generally costs significantly less than traditional broadcast or print advertisements however, it does offer a low-risk investment that likely complements other forms of advertising and may be particularly effective for reaching very specific subpopulations that may be of particular interest to some brands. Another prominent theme identified was price promotions, discounts and price breaks. This was particularly evident for cigars, snus and the one cigarette advertisement identified. It is well known that price influences uptake and use of tobacco;9 ,37 ,38 this message, therefore, may be more likely to attract the attention of individuals with less financial resources available to them. This includes youth and young adults and smokers of lower socioeconomic status more generally, who are also an at-risk group for tobacco-related morbidity and mortality.39 ,40 Additionally, some e-cigarette, cigar and snus advertisements were placed on websites that have a high proportion of blacks and Hispanics as their audience, greater than the proportion of these demographic subgroups in the US population41 and much greater than that in the Canadian population.42 These are not only populations at-risk for tobacco-related disease,43 but ones that the industry has specifically targeted in the past.44–46 For these reasons, it is critical to continue to examine the degree to which the tobacco and e-cigarette industries messages are specifically tailoring and/or placing advertisements to appeal to minority and vulnerable audiences. Further research will also be necessary to consider how the themes, messaging and channels used to advertise are influenced by the current regulatory context and emergence of new tobacco products. While this study may suggest that many companies are not advertising their products online, there remains a sizable portion of pro-tobacco content online. User-generated promotional messages are being spread through YouTube,21 ,22 Instagram23 and Facebook,24 ,25 as well as online blogs and forums, such as those dedicated to e-cigarette users.47 Additionally, although not captured by Competitrack, advertisements for tobacco products and e-cigarettes are also circulated online through affiliate marketing (N Cobb, Maryland, USA, unpublished data, May 2013). Traditional online advertisements captured by Competitrack coexist with these alternate forms of pro-tobacco content. Assessment of the sum total of pro-tobacco content online is crucial for determining the overall effects of promotional material on tobacco-related attitudes, beliefs and behaviour and important when considering the challenges of regulating pro-tobacco content online. As pointed out in Freeman's article,48 Article 13 of WHO Framework Convention on Tobacco Control49 requires all 172 ratifying nations, barring constitutional limitations, to adopt a total ban on tobacco advertising, promotion and sponsorship. However, the guidelines recognise that banning only traditional forms of tobacco advertising could simply lead to promotion of tobacco through other means,50 which may include covertly posting content on YouTube and social media. While it would be near impossible to monitor all content connected to tobacco on the internet, information on how user-generated pro-tobacco content online influences tobacco use trajectories, particularly youth initiation and continuation of use among current users, can inform policy and aid in public education efforts. Currently, there are over 2 billion people worldwide on the internet, and the online population continues to grow.51 The tremendous reach of the internet offers a great opportunity for tobacco and e-cigarette companies to tailor message content and delivery to their target audience. Given the relative lack of regulatory authority over online content, and the evolving nature of the tobacco product marketplace, it is critical to monitor promotional messages sponsored by these industries. This study is the first to provide a comprehensive surveillance of all tobacco and e-cigarette online banner/video advertising occurring online over a full year, and lays the groundwork for future work to further investigate the impact of these advertisements on consumer attitudes and behaviour. Although it is well known that the internet is widely accessible to the global population, there has been almost no surveillance of tobacco-related advertisements online and very limited characterisation of its content and the audience to which it is advertising. This study fills this gap by providing much needed information on the volume and characteristics of tobacco advertisements, specifically whether these advertisements communicate scientifically accurate information and the degree to which they are accessible to youth. These two points are critically important for policymakers to consider as part of efforts to regulate tobacco and its advertising to prevent youth from initiating tobacco use and reduce the burden of tobacco-related illness in society. The authors would like to acknowledge Greta Tessman (FDA), Tarsha McCrae (FDA) and Genevieve Vullo (Kelly Government Solutions) for their participation in this project and contributions to the manuscript.
. The tobacco atlas. 4th edn. Atlanta, GA: American Cancer Society; New York, NY: World Lung Foundation, 2012. Federal Trade Commission. Federal Trade Commission Smokeless Tobacco Report for 2011. Washington, DC, 2013.
. Flavored tobacco product use among U.S. young adults. Am J Prev Med 2013;44:388–91.
. e-Cigarette awareness, use, and harm perceptions in US adults. Am J Public Health 2012;102:1758–66. eng.
. Electronic nicotine delivery systems: adult use and awareness of the ‘e-cigarette’ in the USA. Tob Control 2013;22:19–23.
. Use of emerging tobacco products in the United States. J Environ Public Health 2012;2012.
. R. J. Reynolds goes international with new dissolvable tobacco products. Tob Control 2012;21:368–9. U. S. Department of Health and Human Services. Preventing tobacco use among youth and young adults: a report of the Surgeon General. Atlanta, GA: Centers for Disease Control and Prevention, National Center for Chronic Disease Prevention and Health Promotion, Office on Smoking and Health, 2012. National Cancer Institute. The role of the media in promoting and reducing tobacco use. Bethesda, MD: Tobacco Control Monograph No. 19. NIH Pub. No. 07-6242, U.S. Department of Health and Human Services, National Institutes of Health, National Cancer Institute, 2008.
. The effect of retail cigarette pack displays on unplanned purchases: results from immediate postpurchase interviews. Tob Control 2009;18:218–21.
. The impact of tobacco promotion at the point of sale: a systematic review. Nicotine Tob Res 2009;11:25–35. Department of Health and Human Services. Regulations restricting the sale and distribution of cigarettes and smokeless tobacco products to protect children and adolescents; final rule. Federal Register 1996;61:44396–618. State Attorneys General. Master Settlement Agreement. 1998. Family Smoking Prevention and Tobacco Control Act, HR 1256 (2009). Tobacco Act. Tobacco Act, S.C. 1997, c. 13. An Act to amend the Tobacco Act. An Act to amend the Tobacco Act, S.C. 2009, c. 27.
. Gone viral? Heard the buzz? A guide for public health practitioners and researchers on how Web 2.0 can subvert advertising restrictions and spread health information. J Epidemiol Community Health 2008; 62:778–82.
. YouTube: a promotional vehicle for little cigars and cigarillos? Tob Control 2014;23:21–6.
. Portrayal of smokeless tobacco in YouTube videos. Nicotine Tob Res 2012;14:455–62.
. The cigar ambassador: How Snoop Dogg uses Instagram to promote tobacco use. Tob Control 2014;23:79–80.
. Hookah's new popularity among US college students: a pilot study of the characteristics of hookah smokers and their Facebook displays. BMJ Open 2012;2:e001709.
. British American Tobacco on Facebook: undermining Article 13 of the global World Health Organization Framework Convention on Tobacco Control. Tob Control 2010;19:e1–9.
. How well does advertising work? Generalizations from a meta-analysis of brand advertising elasticity. J Marketing Res 2011;48:457–71.
. How advertising works: What do we really know? J Marketing Res 1999;63:26–43.
. The changing marketing of smokeless tobacco in magazine advertisements. Nicotine Tob Res 2011;13:540–7. eng.
. Every document and picture tells a story: using internal corporate document reviews, semiotics, and content analysis to assess tobacco advertising. Tob Control 2006;15:254–61. Federal Trade Commission. Federal Trade Commission cigarette report for 2011. Washington, DC, 2013.
. The last straw? Cigarette advertising and realized market shares among youth and adults, 1979–1993. J Marketing 1996;60:1–16.
. E-Cigarette or drug-delivery device? Regulating novel nicotine products. N Engl J Med 2011;365:193–5.
. Novel nicotine delivery systems and public health: the rise of the “e-cigarette”. Am J Public Health 2010;100:2340–2. eng.
. Evidence reviews and recommendations on interventions to reduce tobacco use and exposure to environmental tobacco smoke: a summary of selected guidelines. Amer J of Prev Med 2001;20:67–87.
. Price and tobacco marketing strategy: lessons from ‘dark’ markets and implications for the WHO Framework Convention on Tobacco Control. Tob Control 2012;21:519–23.
. Tobacco smoking, cancer and social class. IARC Sci Publ 1997:229–50.
. Cross-national sources of health inequality: education and tobacco use in the World Health Survey. Demography 2011;48: 653–74.
. Overview of race and hispanic origin: 2010. Washington, DC: U.S. Department of Commerce, Economics and Statistics Administration, U.S. Census Bureau, 2011. Government of Canada, Statistics Canada. Visible minority population, by age group (2006 census). Canada: Government of Canada, 2006.
. Identifying health disparities across the tobacco continuum. Addiction 2007;102:5–29. eng.
. Finding the Kool Mixx: how Brown & Williamson used music marketing to sell cigarettes. Tob Control 2006;15:359–66.
. Special efforts for special markets. RJ Reynolds Tobacco Co. 1988. Bates No. 507714729/4731. http://legacy.library.ucsf.edu/tid/dqu61d00 (accessed 5 Jun 2013).
. A historical review of R.J. Reynolds’ strategies for marketing tobacco to Hispanics in the United States. Am J Public Health 2013;103:e15–27.
. Health-related effects reported by electronic cigarette users in online forums. J Med Internet Res 2013;15:e59.
. New media and tobacco control. Tob Control 2012;21:139–44. World Health Organization. Parties to the WHO Framework Convention on Tobacco Control. 2011. World Health Organization. Guidelines for implementation of Article 13 of the WHO Framework Convention on Tobacco Control (Tobacco advertising, promotion and sponsorship). Geneva, Switzerland: World Health Organization, 2008. United Nations International Telecommunications Unions. Key ICT indicators for developed and developing countries and the world (totals and penetration rates). Geneva, Switzerland: United Nations ICT Data and Statistics Division, 2013. Contributors AR conceived of the idea, drew up the analytic plan, oversaw data collection, interpreted results and wrote the manuscript. OG did the data collection, helped with formatting tables, helped draft the Introduction and aided with literature reviews and references. DV provided input on the manuscript drafts. Funding This project has been funded in whole or in part with Federal funds from the National Institute on Drug Abuse, National Institutes of Health, and the Food and Drug Administration, Department of Health and Human Services, under Contract No. HHSN271201100027C. Disclaimer The views and opinions expressed in this presentation are those of the authors only and do not necessarily represent the views, official policy or position of the US Department of Health and Human Services or any of its affiliated institutions or agencies.